Hemicentetes semispinosus is known as the lowland streaked tenerec. Apart from their bizarre black and yellow hairy appearance these guys have found ways to us their hair that most mammals would never think of. 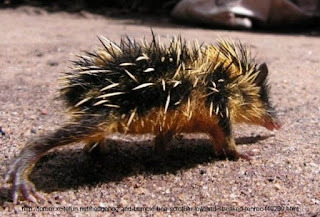 Their quills are essentially big thick hairs and are very useful in self defense. When this little tenerec gets scared its quills become erect and point forward. At this point the tenerec uses them as a weapon and drives them into whatever it finds threatening. Some quills are armed with little barbs to make the whole experience a little less enjoyable for whatever is hunting the tenerec. Other quills have been specially modified to make noises as they are rubbed together. These noises are used as a means of rudimentary communication, especially for instances such as a mother and child trying to find each other. Hemicentetes semispinosus can only be found in Eastern Madagascar.